Cabbage are set to release yet another EP – that is, another snippet of their musical madness – entitled ‘Celebration Of A Disease’, and there are no signs of them turning radio friendly. Nonetheless, their fan base just keeps growing and growing. 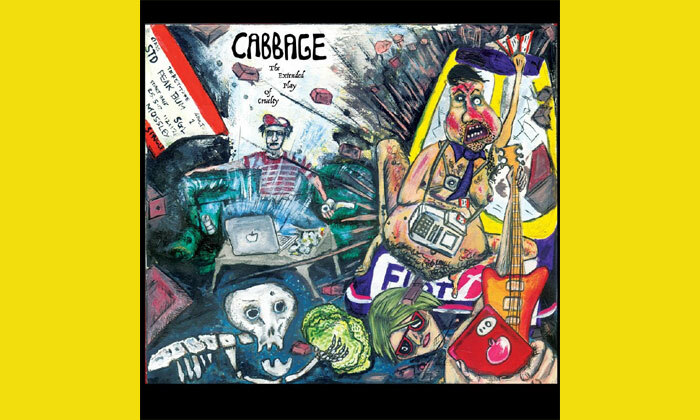 The title track opens the EP and it only takes the first few chords for you to know it’s Cabbage, and it sounds great. They are stamping their sound throughout the UK and this is just another beauty to come from these guys. The one thing you can guarantee about this band is that they’ll always have something controversial to say, but that’s partly what got us hooked in the first place. Today, Cabbage blasted the privatisation of the rail with ‘A Network Betrayal’ which sees Joe on lead vocals, and it certainly suits them. The chorus is a brilliantly typical Cabbage sing-a-long number, and it’s what Cabbage are all about; taking what people are thinking and turning it into epic songs such as this. ‘Asa Morley’ is just pure madness, and it’s songs like this that make you want to really get into in the minds of these guys because few possess such a strange, yet broad, imagination. With ‘Celebration Of A Disease’, Cabbage sound better than ever before and people surely must be getting excited to go out and see them on the live stage. In short, this EP is just an incredible experience.